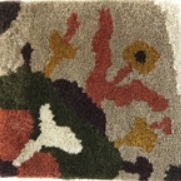 Nanimarquina, Victoria 1 carpet: This handknotted rug, designed by Sybilla, reproduces a careful, symmetrical floral fantasy which, together with well-studied combinations and blends of colour, achieves a fascinating final result with a high degree of sensitivity. Nanimarquina, Victoria 1 carpet: This handknotted rug, designed by Sybilla, reproduces a careful, symmetrical floral fantasy which, together with well-studied combinations and blends of colour, achieves a fascinating final result with a high degree of sensitivity. The ambiguity of its graphics, midway between classical and contemporary aesthetics, brings it closer to a certain neo-baroque style, turning it into a contender for being queen of the house. Pure luxury for atmospheres that express richness in elegant tones and proud forms.